Beach of contract is one of the most common civil causes of action and a part of most commercial litigation cases. Contracts can be oral or written but some types of contracts must be in writing pursuant to the Statute of Frauds. In order to prove a breach of contract case we must prove the existence of a valid contract. This is much easier when the contract is in writing but can also be done with an oral or implied agreement. Whether in writing or not, a contract requires two or more parties who have agreed to obligate themselves to one another. One common example is where one party has agreed to provide some service and the other party has agreed to pay for that service. The parties to a contract must be competent for a contract to be enforceable. Once it is established that a contract exists we must prove that the plaintiff substantially performed his duties under the contract or that he was justified in not performing his duties under the contract. Justifiable reasons for not performing may include when the other party has made performance impractical or impossible. In addition to performing their own duties under the contract, the plaintiff must also show that the defendant failed to perform her duties under the contract. A simple example is an installment sales contract where one party delivers a product to the other party, and the party receiving the product agrees to pay for the product over time in a series of installments. The party that has delivered the product has performed his duties under the contract and if the defendant fails to make her payments, she is likely in breach of the contract. A defendant accused of breach of contract can attack any of the elements of the claim, but they may also raise various other defenses to the claim. One important defense is asserting that the plaintiff has failed to mitigate his damages. When two parties have a contract together and one party breaches the contract, the plaintiff has a duty to take reasonable steps to limit additional damage. A familiar example of this duty when someone loses their job and must try to find a new job when suing for lost wages. It is important to note that when raising this defense, the burden is on the breaching party to show that the party bringing the breach of contract claim failed to use reasonable efforts to mitigate his damages. Another common defense to a breach of contract claim is the failure of the party alleging the breach to perform their duties under the contract. This is simple on paper but hard to prove because often both parties breach the contract at different time, in different manners and for different reasons. 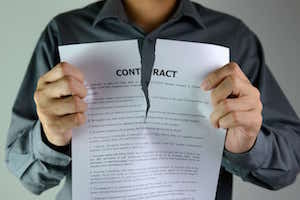 This is a very simplified and generalized discussion of breach of contract claims and there are a number of important exceptions, caveats and defenses that have not been included. If you want to explore how you may recover for someone else’s breach of contract or find yourself in danger of being sued for breach of contract, have already been sued for breach of contract please contact the Stoltmann Law Offices Commercial Litigation Group at 312-332-4200. $1,471,351 verdict for a plaintiff who loaned defendant $20,000 to use in his nursing home business. Defendant contended it was an investment rather than a loan and that the contract was a forgery. Loftus successfully argued contract was valid and required interest above the legal rate and attorneys fees paid to the non-breaching party. The judge awarded over one million dollars in interest finding that Attorney Loftus proved the contract was valid and agreed to by the parties and an exception applied allowing the high rate of interest. The final offer before trial was just $20,000 This case was featured on the front page of the Chicago Daily Law Bulletin.